Now that Bruce Wayne has both secretly reclaimed the mantle of the bat and... not-so-secretly announced Wayne Enterprises' massive funding of the crimefighter, the hero is kicking off his quest to recruit as many worthy Batmen and women has he can find to forge a less crime-filled tomorrow in the pages of DC Comics' Batman, Inc. storyline by Grant Morrison and Yanick Paquette.Filling out the first wave of figures are the original Batman, his son Damian as Robin, the UK's Knight and the Native American hero Man of Bats. I'm not much of a betting man, but I have a feeling this line could be coupled with another down the road given the many Batfolks we've seen in the past few years of Morrison's run. 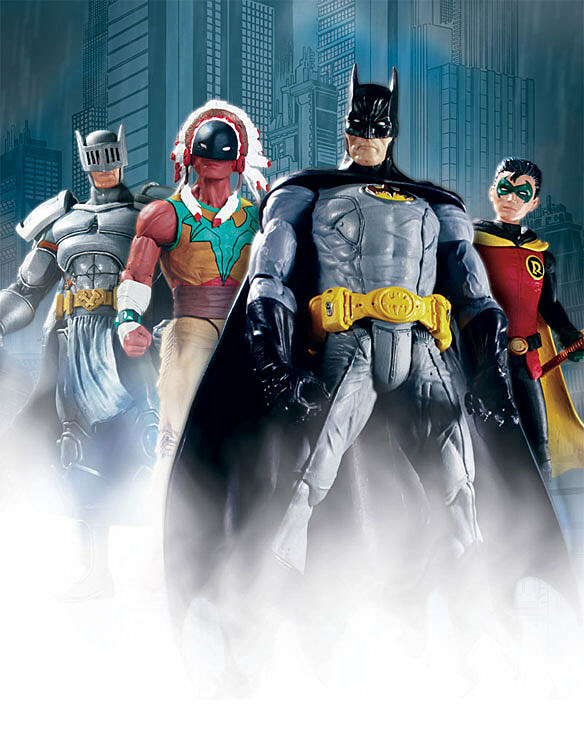 The figures won't arrive in stores until July 6, though, which means fans will have to pretend their old yellow oval logo-chested Batman action figures are recruiting their other toys to kick crime in the ribs... which actually sounds like a lot of fun, come to think of it.